The Glamorous Life of a Housewife: Honey....I'm HOME! That pretty much sums up our vacation. Wow. We had the BEST time, and I can not even begin to capture it all on here. I journaled, video taped and took hundreds of pictures of the entire thing. It was one of the most fantastical weeks of my life - just me and husby traveling around the country (and out of the country for 3 days) and blissfully enjoying each other and the sights for 8 full days. We were supposed to get back home last night at around 8, but there was a huge airport mix up and turns out we didn't leave Seattle until 10 PM yesterday and spent the last 24 hours either on a plane or in an airport. It was not the most fun day of my life, and when we got home today, we crashed in bed due to the forced "all-nighter" we pulled last night. Whew, we were so exhausted that both of us were nauseous. So. I want to show you a little of what we saw over the past week, but if I showed you in one post, you might slip into a coma due to mass amounts of content. And that is not what I want. Because I love you. So, I will spread it out throughout this next week and show you a few days at a time the wonderful vacation of husby and I. And let me tell you. It is impossible trying to narrow down the pictures to show. Sit back, grab an ice tea and let's re-live vaca! DAY ONE - The Arrival. It all started in the air. When almost to Seattle, we gazed out the window and a spectacular view caught our eye. This mountain, Mt. Rainier, was absolutely gorgeous and we asked the nice fellow next to us all about it. He recommended that we must take one day to go explore it, so we jotted it down and knew we had to go. Check out my new travel bag. Isn't it just the cutest? When we landed, we were blown into a whirlwind of the Pacific Northwest - which means, ultra cool weather! I was freezing at this point. And in Heaven. It was a welcomed change from the 100+ temperatures of home. We grabbed our rental car, a Jeep Patriot and headed to our hotel to check in. We stayed in a small town outside of Seattle, Mukilteo (and yes, we spent the entire week trying to figure out how to pronounce it correctly), and we were absolutely blown away of the beauty of Washington. There were lush, green trees and flowers as far as the eye could see!! It was gorgeous. For example, check out these wild flowers growing behind our hotel. We ended the day by driving around Seattle and Mukilteo scouting it all out and eating at a recommendation from the fellow in the airplane, Claim Jumper. We had never heard of this place and let me tell you right now. It is our new FAVE!! Yummy. We woke up bright and early (due to the 2 hour time difference) and headed to Pike Place Market. We loved it! We ate all day and just walked around soaking in the beautiful weather and the beautiful sites. What an interesting place. This is husby at the original Starbucks! Yes, he loved it. There were fresh flowers everywhere. Enormous bouquets for 15 bucks. I was drooling. We ate until we were stuffed. We had a delicious apple cinnamon roll, a roasted corn on the cob and the self proclaimed "Best Macaroni & Cheese in the World" - and BOY WAS IT! Here is me....dying over this mac. 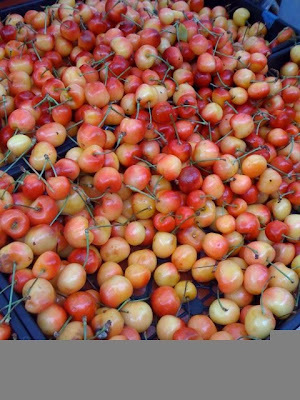 We bought a pound of the BEST cherries - Rainier cherries - and two of the juiciest nectarines your lips have ever embraced. YUM! I love Pike Place Market. When we left the Market, we walked over to Pioneer Square. It is the oldest area/community in Seattle. And then we found the Freemont Bridge Troll. Sounds fun, I love Pike's Market, I'm sure you saw the throwing of the fish! How fun! Glad you made it home safely. It looks so metropolitan, and so unlike Texas. I'm putting it on the "must visit" list. And, that pic of Mt. Ranier - AWESOME! Oh how fun! Looks like you had a blast. It looks like you all had a blast. Ok, I'm jealous..the original starbucks!?! How cool!? Glad you guys had tons of fun! && I love your travel bag! I'm so glad you had a good time! I can't wait to see more! welcome back! so glad you had such a fabulous time! awesome, pictures. that mac & cheese made me drool!!! Glad you had such a terrific time. I'm going for a long weekend in October, you'll have to give me a couple of suggestions of what to do. ummm. you are adorable! now i want some cherries! glad you were able to go on vacay with husby!! !